More than 10,000 British firms have revealed the difference between what they pay men and women. This is the second year that all companies with 250 or more employees have been required to disclose their pay gaps, revealing that more than three in four companies pay men more than they pay women. 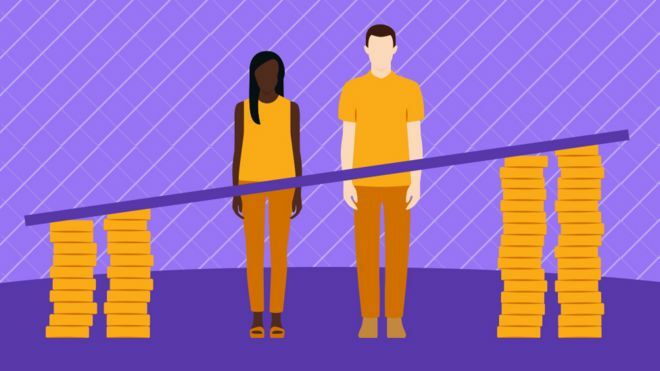 This is how the UK's pay gap sizes up. This article contains animated content, if you would prefer not to see this, you can turn animation off by clicking the toggle below. 10,443 companies have disclosed the average difference between what they pay men and women. 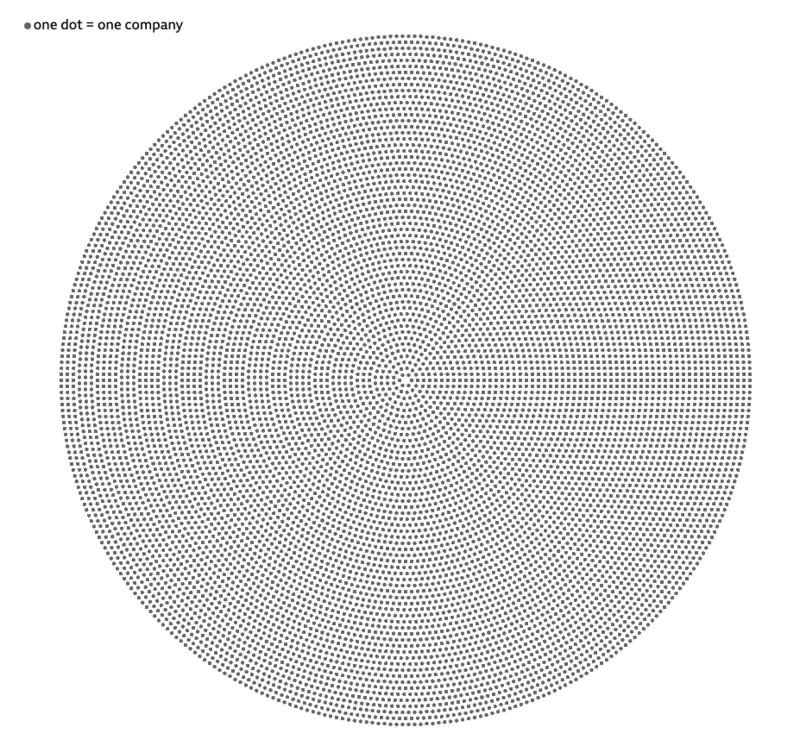 Each dot represents one company. If you work at a large firm it probably pays the average man more than the average woman - 8,124 companies pay men more, while just 1,424 pay women more. 895 companies have reported no pay gap at all. Let's get rid of those for now. 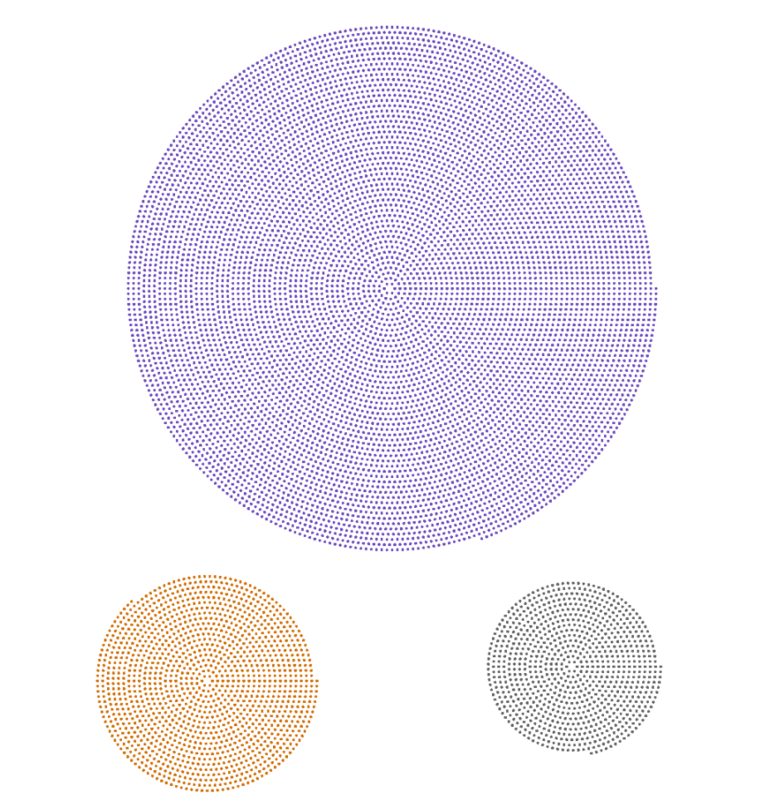 This is what it looks like when we reorder the companies by the size of their gender pay gaps. The ones at the top and bottom have reported the biggest difference between what they pay men and women. EasyJet pays men 47.9% more. That's one of the widest pay gaps reported among larger firms. The ones closest to the middle have the smallest pay gaps, for instance Royal Mail, with a 1% pay gap. The average pay gap reported is 9.6%, meaning that for every £1 the average man earns, the average woman takes home 90p. This means the gap has barely moved from last year, when it was 9.7%. The gender pay gap doesn't tell us if women are being paid less for the same job, something which has been illegal for decades. But it does let us size up the differences in men and women's occupations and working patterns. Women are much more likely to work part-time, and are under-represented in senior roles. Take airlines. Many have reported big pay gaps. Why? High-paid pilots are almost exclusively men, while women predominantly work as lower-paid cabin crew. Ryanair has reported a 64.4% pay gap. Other airlines like EasyJet, TUI, Flybe and Jet2.com all have pay gaps of at least 40%. Let's look at the banks. The finance and insurance sector has one of the widest pay gaps. Women working in this sector are paid 22.9% less than men. Barclays Investment Bank, Lloyds Bank and Clydesdale Bank all report pay gaps of close to or above 40%. What happens when we look at the pay gap in individual sectors? All sectors, on average, pay men more than women. But looking closer at how pay differences stack up reveals that some sectors are more equal than others. Almost all employers in the finance sector on average pay men more than women. Only 17 of the finance firms that have disclosed their figures pay women more. Construction is a male-dominated industry, but the women who do work in it are more likely to work in lower-paid jobs. Because of this, it has the widest pay gap of any sector. Although education as a whole is dominated by women, they are over-represented in lower-paid jobs. Many schools have men in the most senior roles, creating very wide pay gaps. Women in the retail sector are over-represented in lower-paid jobs. The pay gap in retail is also driven by women being less likely to take up unsociable hours, a study by PwC found. No sector pays women as much as men, but the accommodation and food sector comes closest to equality. Companies often pay a flat rate for most roles, which is why so many report a 0% pay gap. The health sector is female-dominated, but men are over-represented in senior clinical roles, in private and public sector. This is now changing with more female doctors at junior levels. One of the causes of the gender pay gap is that there are fewer women in more senior, higher-paid jobs. A deep dive into the data shows that the proportion of women falls as pay levels rise. This happens in every sector. 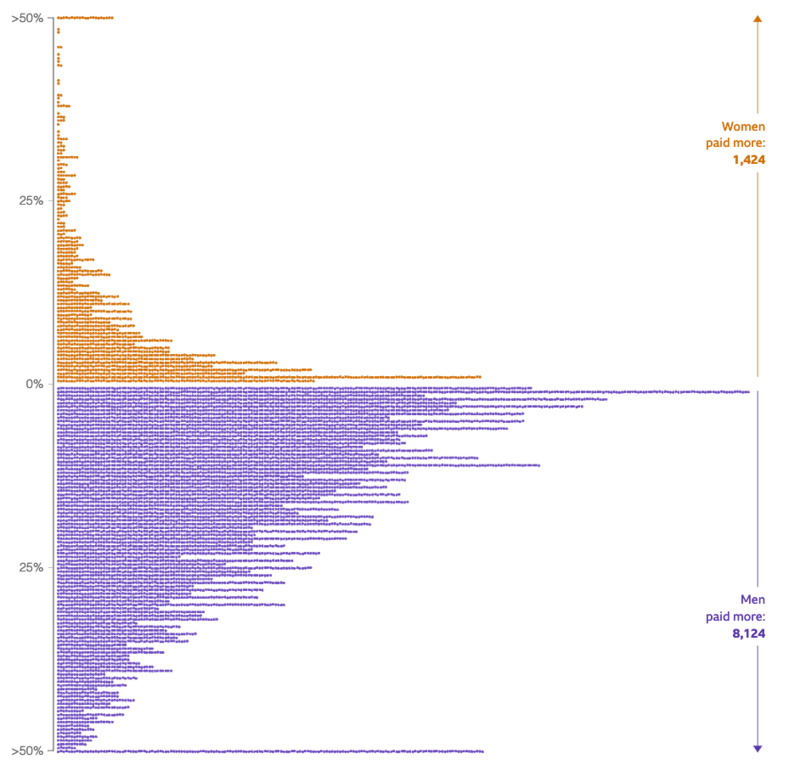 In sectors with the widest pay gaps, women are also most under-represented at top levels. Finance and construction are two examples of this. In contrast, where women are more evenly represented in lower and higher-paid jobs, the pay gap is smaller. The health and accommodation and food sectors are two examples of this. You can read about the methodology behind our analysis here and find out the pay gap where you work by using our interactive calculator. Design by Irene de la Torre Arenas. Development by Becky Rush. Illustration based on images by Getty. Written and produced by Clara Guibourg and Nassos Stylianou.